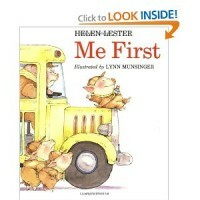 Why I like this book: In our social groups we have many kiddos who HAVE to be first. A good silly story to address the concept. 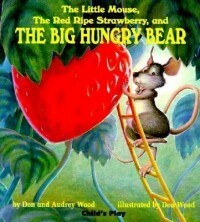 Also a great story for language flexibility, and narrative skills. Discuss and demonstrate the body language when Pinkerton pushes past them to be first. Use thinking bubbles (a white board, regular paper) and discuss how those characters feel and why. What are friends thinking of Pinkerton? Problem solve ways to cope when you aren’t first. A great story to tie to discussion around personal body space. We have used after reading Personal Space Camp by Julia Cook. Practice lining up in a group, managing space, and using words to negotiate who is “first” and next in line. “sandwich” vs. a “sand witch” is demonstrated in this story, as well as “care for” meaning want vs. taking care of. Great example of language flexibility. The author makes a great picture of what Pinkerton was thinking vs. what actually happened. Tie to discussion around idioms and other figurative language. For more examples (check for age appropriateness of course) see Proverbidioms app. 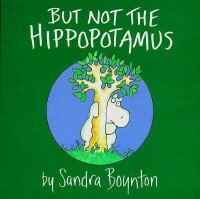 Also can pair with other figurative language stories reviewed on all4mychild. Click on “figurative language” on our home page for more. Great for narrative skills. Have students “retell” the story using the pictures to help. I use with Mindwingconcepts “Braidy,” to help students identify story grammar elements. 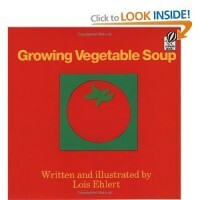 Description: This beautifully illustrated book brings the sequence of growing and enjoying one’s own vegetables to life. Why I like this book: This book offers the “just right” amount of information to use as a primer for a planting unit, and the illustrations are beautiful. Generate sequence cards by copying the key pages of this book and have kids put them into sequence. After reviewing the vegetables introduced in this book and their salient features, play the Bag Game using the set of vegetable pictures. Reinforce the concepts by actually planting some seeds in small cups or gardens and watching them grow over several weeks. The illustrations in this book are very simple, have kids make their own collage art. Have precut shapes available or have the kids trace and cut their own for more fine motor fun. Title: Should I Share My Ice Cream? 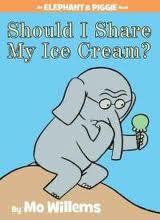 Description: The beloved elephant, Gerald, labors over the decision whether to share his ice cream with friend, Piggie. Should he or shouldn’t he….? Why I like this story: A beautiful story about Gerald who doesn’t want to share his ice cream but knows it would be the friendly thing to do. He thinks about what Piggie might be feeling and makes a decision. The twist at the end is the icing on the cake (or the whipped cream on the ice cream)! Great book to lead off discussion about why we share and how it makes us feel. Talk about Gerald’s facial expressions and body language and how that communicates what he is thinking and feeling. Kids may want to act out Gerald’s exaggerated body language and see if others can guess what they are feeling or thinking. Have kids predict what Gerald will decide based on his page by page reasoning. Discuss how Gerald feels when the plans change unexpectedly. What does Gerald do? What would the kids listening to the story do? 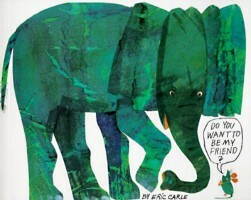 Title: Do You Want To Be My Friend? Description: A lonely mouse is looking for a friend to play with. He has to ask a lot of animals before he finds the right one. Why I like this book: It’s a simple, mainly wordless book that kids love and can be adapted for a number of speech, language or social goals across ages. Have children predict what animal is coming next. The tail of each animal is shown before the actual animal. Have them make guesses. Great for possession. The Elephant‘s tail, the Seal’s tail, etc. Good for part/whole relationships as well. Why questions and reasoning. WHY isn’t the horse a good fit for the mouse? (grumpy or too big) WHY isn’t the elephant a good fit for the mouse? (too big, would be hard to play with, etc.). WHY isn’t the snake a good fit? (he would eat the mouse!) Because it’s wordless, have kids predict what the animal is likely say to the mouse. Can add in tone of voice discussion as well. 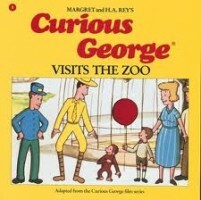 Print pictures of the animals, or use toy animals and have children sequence the story. Add in temporal markers such as first, next, then, etc. Have children “act” out the story. If in a group, many animals to re-enact. If not in a group, provide a toy mouse or have the child be the toy mouse and ask other “animals” to play in the accurate order. For a social group- good for discussion around joining others play. It doesn’t always work out. Good to discuss this concept and what makes a good friend. The mouse doesn’t give up, and eventually finds a “good match” for a friend. 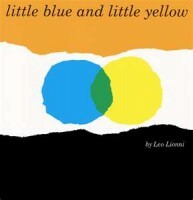 Description: Best friends, little blue and little yellow, have lots of fun playing together. When they hug each other, their color changes, which creates a problem. This story about friends, family, and fun can be read and played out on many different levels. Why I like this book: All of the characters in this book are represented by torn pieces of colored paper. Yet, children are captivated by how they come alive in the book as they play together, spent time in their homes with family, cry, and rejoice. As you read the book through the first time, ask questions about how the “friends” and “papas and mamas” feel based on what the torn paper “characters” look like on the page. Ask kids if they can predict what will happen as the story unfolds. See if kids can interpret the actions of the characters on each page as the colors are shown playing hide-n-seek, ring around the rosie, jumping, and going through tunnels. Have kids think of solutions to problems that arise in the story. After reading the story, have the kids re-tell the story in the proper sequence. Make an obstacle course to act out the story. Have kids tear up pieces of construction paper and create their own stories with their own colors and actions. Give each child one color and have the kids make a group mural of the entire story sequence. 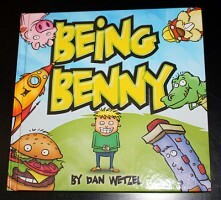 Why I like this book: Benny uses his imagination rather than “screens” to make his day more interesting. I like to use this book to talk about using the brain as a tool for eliminating boredom. • After kids have talked about what they would like to be, see if each child can remember one thing a friend wanted to be. • Discuss similarities in what kids in the group would choose to be or do to build friend files. • Play charades acting out the pictures in the book. • Find out what the kids do on rainy days and help them think about other ways to use their imaginations for fun. • Instead of reading the words of the story, show the pictures and work on “why?” questions. Why does Momma have a bandaid, an umbrella, etc? The body language in the illustrations is fantastic. Once you’ve set the stage, see how much of the story kids can figure out using just the pictures. • After reading a couple pages, see if kids can guess what else might be in Momma’s purse. • In a group? Have kids take turns being Rachael, David and Momma. Focus on the feelings that each of them has throughout the story. Talk about how David’s perspective might have changed at the end. • The page where David takes the bucket is great for Theory of Mind. Where does each of the characters “think” the bucket is? Who actually “knows” where it is?